The savvy cooks answer to a Pavlova Party. Dust a clean work surface with corn meal. Arrange 12 squares fresh pasta over corn meal. Sprinkle a tiny pinch sea salt into the center of each square. Set egg yolk over salt. Use a finger or brush to paint a picture frame of egg white around yolk. Cover with another pasta square, using fingers to gently enclose yolk. Use a sharp knife to trim a centimeter off each side of square, sealing ravioli closed. Bring a large pot of salted water to a boil. Reduce heat to a nice simmer and gently lower ravioli into water. Let cook - stirring just enough to prevent sticking, until ravioli float to surface of water. Let cook a minute longer. Use a slotted spoon to remove from water. 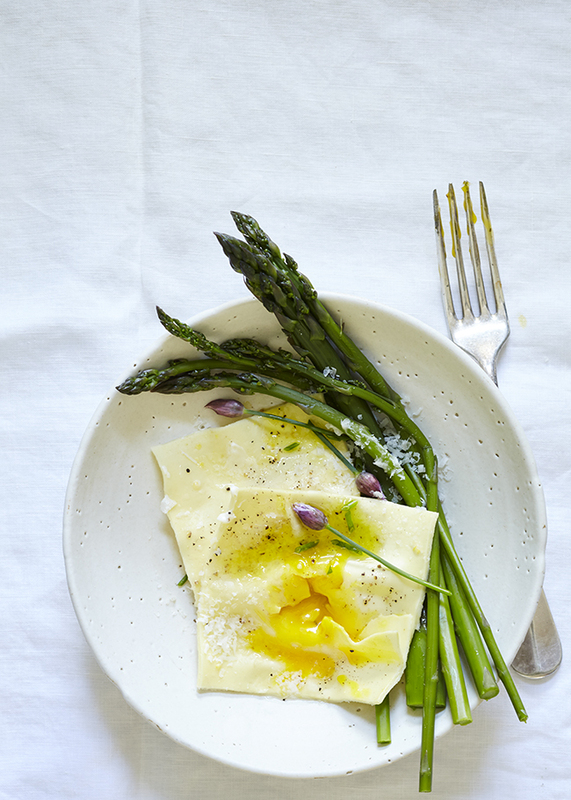 Blot dry on a clean kitchen towel and serve immediately with blanched asparagus, chives, a good glug of olive oil and sprinkle of cheese.